For years, Marine Corps Forces Special Operations Command has received attention mostly for its actions in Afghanistan. It’s far from the only theater the elite force has teams in, however. From Africa to the Pacific, Marine special operators have deployed across the globe to work, mostly in the shadows. 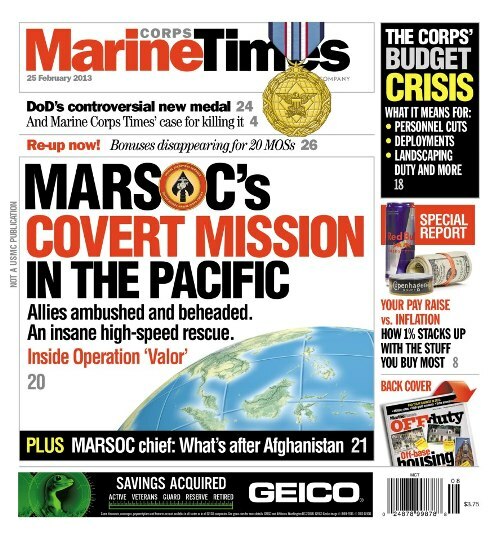 This week’s Marine Corps Times cover story takes a look at those missions, focusing closely on one high-speed rescue in the Philippines. I caught wind of the rescue recently during a dinner in Washington, D.C., and MARSOC provided enough details afterward to make it clear how dangerous special operations can be, even in a country that has a close relationship with the U.S. This week’s newspaper also has a companion story in which Maj. Gen. Mark Clark, MARSOC’s commander, outlines the force’s future. Like the rest of the Corps, MARSOC is preparing for a transition that will include more maritime missions. Clark outlines how the command is getting ready, and will fit in with other parts of U.S. Special Operations Command. Additionally, the latest issue has a lengthy piece that outlines how the Corps is preparing for the massive budget crisis threatening the military. Commandant Gen. Jim Amos, and his top budget officer, Lt. Gen. John Wissler, both weighed in last week, with the commandant addressing the issue multiple times at public events in Washington. As always MARSOC is in the front: First to fight, wherever it would be.